"In the malicious RTF, a vulnerable OLE file is embedded with \object and \objocx tags. ... Upon opening a crafted file with the vulnerable application, as in other document exploit files, we see an innocent file posing as bait, while in the background, the Trojan files are installed." 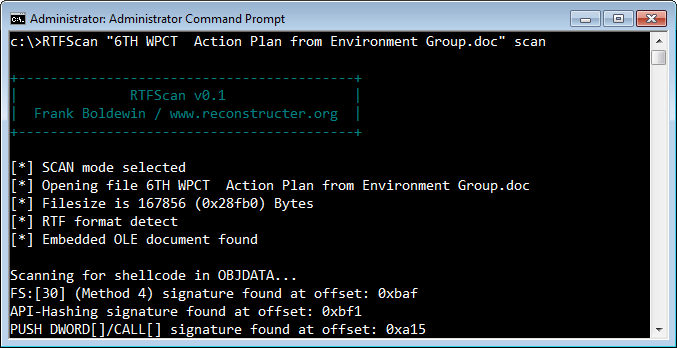 RTFScan automatically located the embedded PE file and extracted it. In this case, the malicious executable wasn't directly stored within the RTF file. Instead, the RTF file embedded an OLE object that included the attacker's shellcode. A vulnerable version of Microsoft Word could be tricked into executing the shellcode, which deobfuscated and extracted the malicious PE executable hidden within it. If this is interesting to you, take a look at the article How Malicious Code Can Run in Microsoft Office Documents.